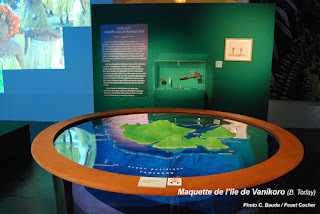 From 19th March to 20th October 2008, to coincide with the final expedition to Vanikoro, the musée de la Marine in Paris, in co-operation with the Association Salomon, staged an ambitious temporary exhibition Le mystère Lapérouse, enquête dans le Pacifique sud. As well as artefacts from the shipwrecks, the exhibition brought together a comprehensive set of paintings, maps drawings and documents - 700 objects in all from a dozen different collections. Since the brochure and a few dossiers remain on the on the internet, I thought I would use the outline of the exhibition to pull together a few notes. It is difficult today to grasp the immense effort involved in a voyage of exploration at the end of the 18th century. The first rooms of the exhibition present the principal figures behind the initiative: Louis XVI, the maréchal de Castries, Minister for the Navy, Claret de Fleurieu, Director of Ports and Arsenals, and the comte d’Hector, the naval commander at Brest; La Pérouse and Fleuriot de Langle, the captains of the frigates, and the fourteen scientists who sailed with them. Also included were those went in search of the expedition from 1791 onwards: d’Entrecasteaux, Peter Dillon and Dumont d’Urville. 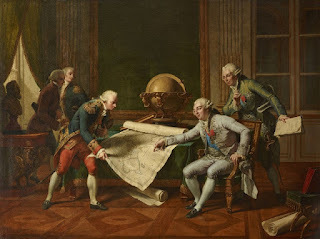 Nicolas-André Monsiau, Louis XVI giving his instructions to La Pérouse, oil on canvas, 1817. This famous painting is not contemporary, but was commissioned for the galerie de Diane at Versailles by Louis XVIII to rehabilitate the image of his brother. It represents the meeting between Louis XVI, de Castries and La Pérouse which took place on 28th June 1785. Immensely interested in geography and maritime affairs, the King was personally much engaged with the expedition. Evidently, the voyage’s success depended heavily on those chosen to lead it. La Pérouse himself was esteemed as a man of quality and a fine sailor. Having entered the elite gardes de la Marine at the age of fifteen, he had served continuously as a navigator. He had distinguished himself in the American War of Independence (famously by his capture of two English forts on the Hudson in 1782). A leader of men, and a scientist, he had shown himself curious about latest technical innovations in navigation. He himself suggested Fleuriot de Langle to Louis XVI as commander of the second frigate: “ No-one in the Navy is more capable than he to second me. He is the choice of both my mind and my heart”. The dramatic disappearance of the ships in the Pacific and the absence of information in the years which followed, reinforced the legend of La Pérouse as a sailor who was out of the ordinary. The apprehension, then final confirmation, of the cataclysmic loss of the expedition, occupied men's minds until finally, after a long period of searching, the shipwreck of the Astrolabe and the Boussole on the reefs of Vanikoro was finally confirmed. Following the end of the American War of Independence, the time was propitious to turn to peaceful exploration. The English had made the first advances with the three voyages of James Cook between 1768 and 1780; Louis XVI now decided that France must take her place and commanded a great voyage. The French navy possessed the necessary technical competence thanks to the Académie royale de la Marine, founded in Brest in 1752. Formal instructions were drawn up jointly by Louis XVI himself, de Castries and Claret de Fleurieu. 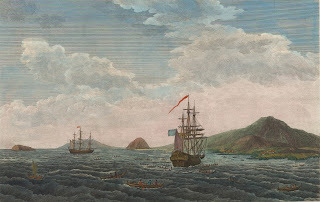 The voyage was to last three years and had multiple objectives: to complete the mapping of the Pacific (particularly the north-west of America and the Asiatic coast); to further French economic interests by establishing outposts for the fur trade with western America and China; and to carry out an ambitious programme of scientific observations. In the spirit of the Enlightenment, native peoples were to be observed but treated with respect; La Pérouse was to use violence against them only if members of his crew were in danger. 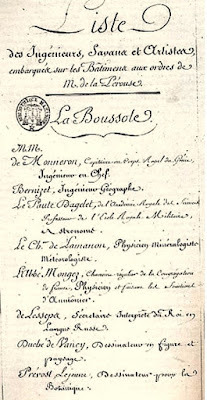 Title page of the Instructions to La Pérouse; copy which belonged to Louis XVI, Bibl. Mazarine. "Although the route of S. Lapérouse is set out in the present instruction, with his landing points and the length of his stay, His Majesty does not subject him strictly to this plan. All the calculations presented here must be subject to the circumstances of navigation, the state of his crew, his provisions and buildings, as well as his campaign and accidents which it is impossible to foresee." Preparations for the voyage The commanders and their vessels The two ships, the Astrolabe and the Boussole were fitted out in the port of Brest and set sail on the 1st August 1785. 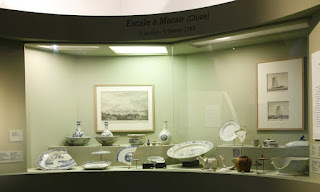 The exhibition sets out items relating to the careers and personalities of the commanders, and members of the crew - officers, savants, artists and, above all, the sailors, many of them local Bretons: “Bretons are the most fit for such ventures, their strength, their character, their lack of calculations for the future, must give them preference” (Hector). The little ships were crowded with 220 men, and weighed down with provisions and equipment for the voyage. They also carried merchandise (helmets, gorgets, whistles, pearls and glass beads, iron tools) to exchange with local inhabitants and barter for fresh provisions. Thirteen "savants" and engineers sailed with the expedition, plus three draftsmen. They took with them an impressive library of 150 books and the most sophisticated scientific instruments of the day. Cartography, astronomy, geography, natural history and physics. In London the engineer Paul Monneron precured precision instruments, and took advice on the prevention of scurvy. 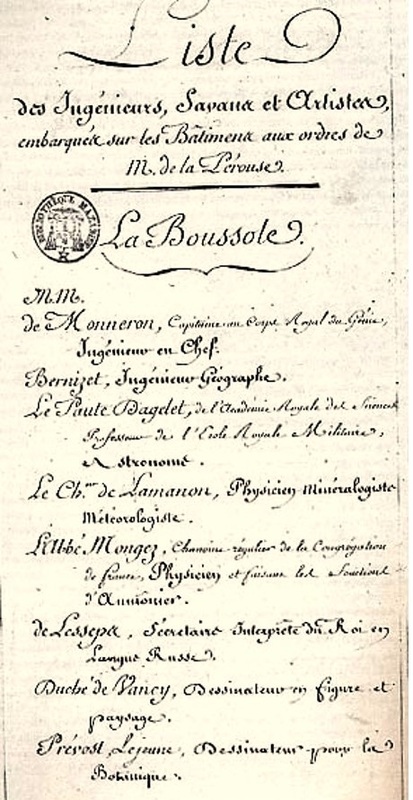 the physician and mineralogist the Chevalier de Lamanon; the physicist Jean André Mongez, chaplain of the Boussole; the cartographer Sebastien Bernizet; the astronomers Louis Monge (who was obliged to leave the expedition at Teneriffe due to seasickness) and Joseph Lepaute Dagelet (who had already participated in the voyage of Yves-Joseph de Kerguelen); botanists Nicolas Collignon and Joseph de La Martinière (also a physician); the naturalist and chaplain of the Astrolabe, père Receveur. The equipping of the ships Following the example of Cook, the expedition comprised two frigates, small but sturdy vessels with capacious holds to store equipment and provisions. They were specially adapted (at Rochefort then Brest) and renamed the Boussole and the Astrolabe. 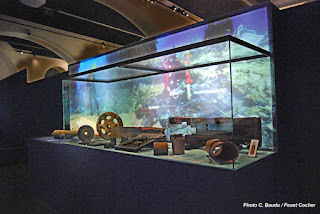 Underwater excavations have yielded fragments of wooden hull reinforcements, part of a pump, pig iron and blocks of lead used as ballast, anchors and bronze pulleys; also ship's bells, a millstone, oven bricks, and a chain lightning conductor. The ships' inventories reveal such items as a "curcubite" for distilling water, and a windmill for the production of flour. Among the scientific instruments were marine clocks and chronometers, sextants, compasses (two of which had belonged to Cook). Graphometer made of copper alloy, made by Langlois, found in 1999. From the wreck of the Astrolabe. Maps, drawings and original documents traced the expedition's extraordinary journey round the Pacific. 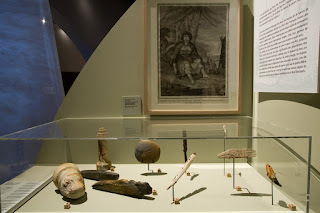 Artefacts from the wrecks testify to La Pérouse's fidelity to his instruction to collect "natural curiosities, both of land and sea", and provide evidence of the commercial exchanges which took place with indigenous populations. However, although it a scientific adventure, it was above all a human one. Objects and accounts evoked everyday life in the close crowded conditions of the ships, the problem of provisioning, health, spiritual life. The exhibition followed the various stages of the voyage. Brest to Hawaii. The ships stopped off in Madeira, in Teneriffe, and briefly in Trinidad, on their way to South American coast. Navigation: The exhibition evoked the grande-chambre on board ship where the officers and scientists took their meals and worked. Navigation, particularly methods for calculating longitude, were discussed. In South America, the La Pérouse stopped at Sainte-Catherine in Brazil (6th-19th November 1785) and Conception in Chile (24 February -15th March 1786). Welcomed by the Spanish colonists; ball, fireworks and a balloon of paper. The escale of 9th-10th April in Hawaii was particularly moving, since it was here that Cook was killed by the natives in 1779. Scenes of sociability and friendly exchange with the islanders show that La Pérouse was anxious to ensure pacific relations with the indigenous population. This was important, as the crews were dependent on trade for fresh food, clean water and wood. Alaska to California. Heading north, the ships anchored at Port des Français (today Lituya Bay in Alaska), 4th-30th July 1786, to map the area and trade for sea otter skins. Their stay was dramatically marked by the drowning of twenty-one sailors at the approach to the bay on 13th July. A letter from Fleuriot and extract from La Pérouse's journal evoked the catastrophe. The famous painting of 1806 in which Louis-Philippe Crépin depicted the incident was also on display. 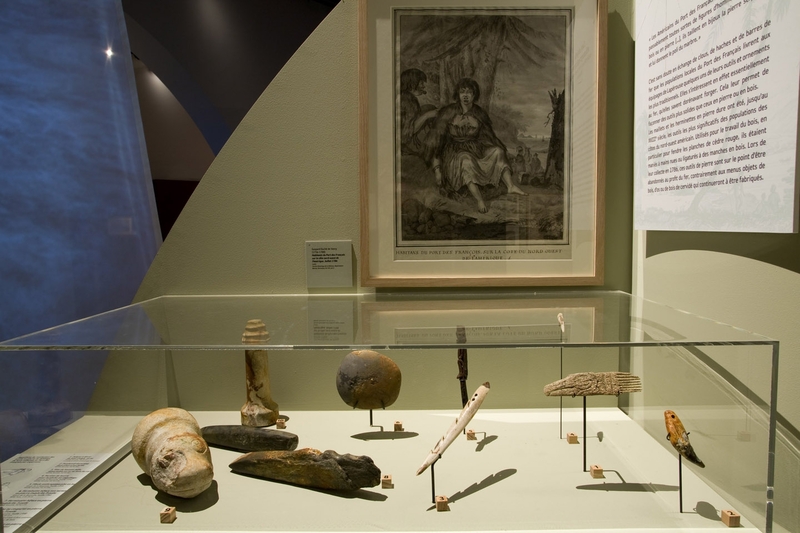 The underwater excavations have yielded various artifacts collected from the people of the region: a brush made out of bone, fragments of harpoons and fishhooks, bears' teeth beads, plus a striking pestle carved in the shape of a manatee. Returning south along the west coast of America, the ships next anchored at Monterey in California (15th-24th September 1786). 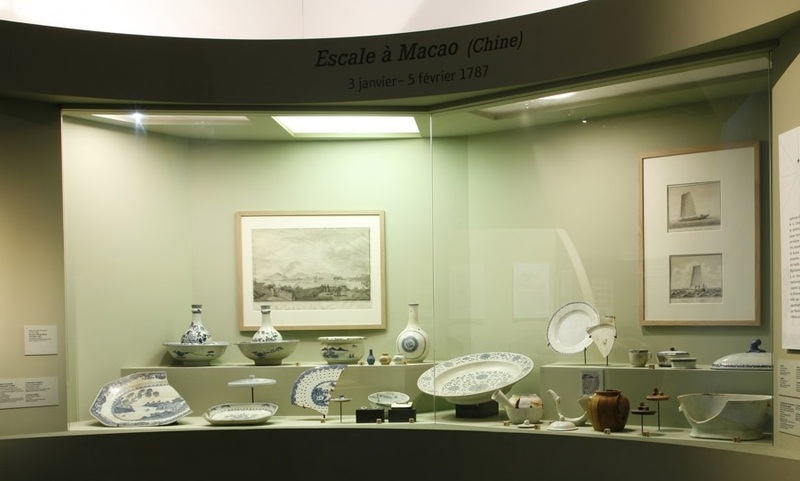 For this leg of the journey, the exhibition showcased the work of the naturalists on board the ships: La Martinière, père Receveur and Collignon, the botanist. Original drawings and plates from the published atlas included a sugar bird, a Californian partridge and sea urchins. Watercolours from the Instructions depicted the baskets and cabinets which had been specially designed by the royal gardener for the transport of plants. The archaeologists had discovered pieces of nutmeg, mineral and shell samples, glass phials and earthernware pots, pestles, scalpels, needles, tweezers. California to Macao. A month's stay at Macao (3rd January to 5th February 1787) gave the French the opportunity to sell their sea otter skins; the naturalist Dufresne returned to France with documents concerning this (highly lucrative) trade. 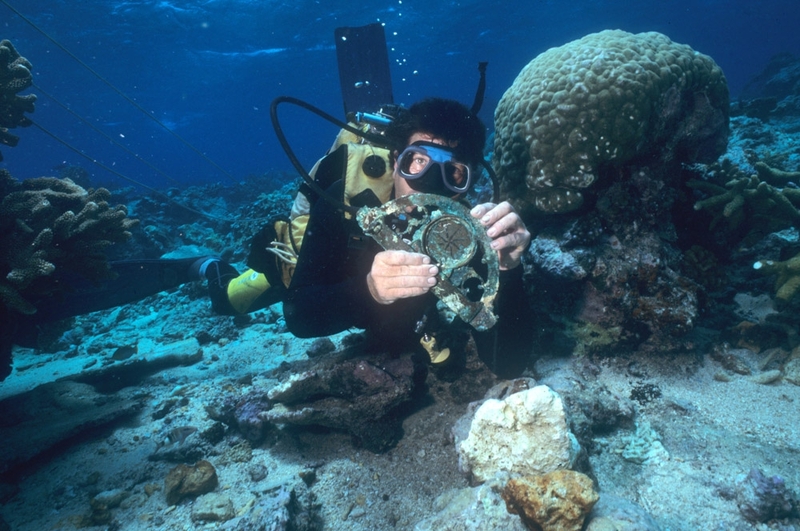 The underwater excavations recovered examples of Chinese porcelain procured at this time, notably items from the service ordered by Mongez, a Franciscan friar, for his congregation. Philippines to the Kamchatka Penninsula. After having nstalled an observatory in Manilla (28th February - 9th April 1787) the expedition journeyed north through China Sea, the Sea of Japan and along the coast of Tartary (Siberia). Drawings by the artists Duché de Vancy and Blondela showed the settlements, boats and everyday life of the native peoples. Monneron, Bernizet and Blondéla completed a cartographical survey. 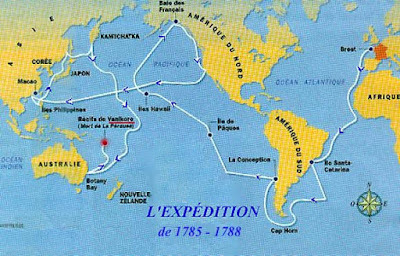 At Kamchatka Barthélémy de Lesseps left the ship and began a thirteen month journey overland through Russia to bring news of the expedition back to France.. Kamchatka to Samoa. 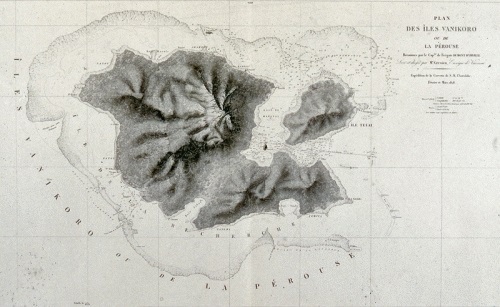 From 9th to 14th December 1787 the ships stopped in the Samoan Islands. They were able to gain fresh provisions for a few baubles. However, disaster struck, when Fleuriot de Langle, the naturalist Lamanon and ten sailors were killed by hostile natives when they attempted to replenish the ships' water supplies. 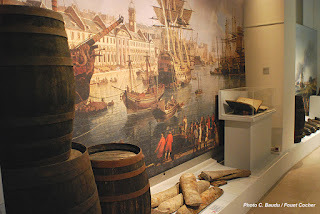 The exhibition focused here on hygiene and role of the ships surgeons Rollin and Lavaux. 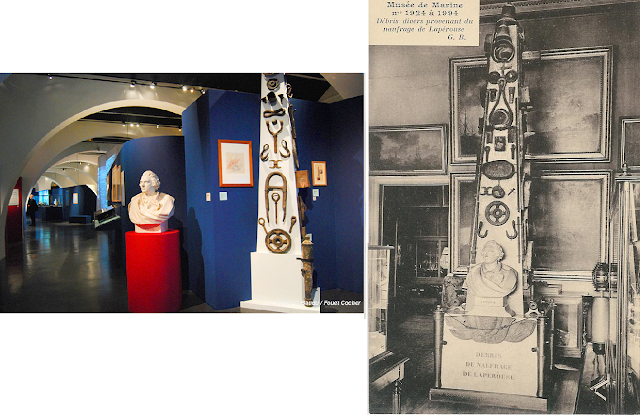 Fragments of surgical instruments found in the wreckage were displayed alongside other contemporary examples from the collections of the L'école de médecine navale in Rochfort. Botany Bay From 26th January to mid-March 1788 the expedition made its last known anchorage. The French arrived shortly after the British First Fleet. Various relics illustrated religious life on board ship, including a substantial stone altar where mass was celebrated on the Boussole. New-Caledonia. An oral tradition existed that white men had buried something on the îlot Konième on the West coast of New Caledonia. A graphometer was later found there. This is the last known evidence for the expedition before its final disappearance. 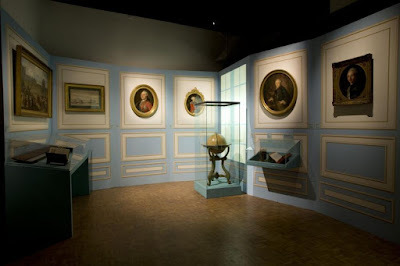 The exhibition devoted rooms to the mission of Entrecastreaux,the discoveries of Dillon and Dumont d'Urville and the various 20th-century expeditions. The final rooms followed the excavations and investigations of the two shipwrecks undertaken by the Association Salomon, with models and footage from the documentary films of Yves Bourgeois. Françoise Massard, "Le mystère Lapérouse: enquête dans le Pacifique sud (Musée de la Marine - Paris)", post of 2008 on marine-marchande.net. Merci de partager cette information précieuse à notre vision. Vous avez posté un blog digne de confiance, continuez à partager.